Pay confidently with Visa® and your MCWV debit and credit cards! Confidence. Simplicity. And the things you love about your MCWV Visa® Debit and Credit Cards. 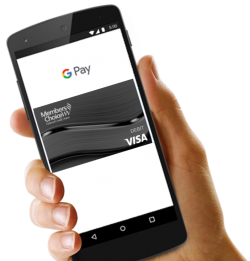 Enjoy the confidence of paying with your phone using your MCWV Visa Debit and Credit Cards on Google Pay™. When you use your phone to pay in stores with an eligible Visa card enrolled in Google Pay, Google Pay doesn’t send your actual credit or debit card number with your payment. Instead, a virtual account number is used to represent your account information – so your account details stay safe. Add your MCWV Visa Debit and Credit cards – it’s as simple as snapping a photo. Use it today! There’s a lot to love about Google Pay. Like how it lets you use your favorite Visa card at millions of places around the world. See stores and apps that accept Google Pay at: pay.google.com/about. Google Pay is a trademark of Google LLC. Now you can easily make payments in your favorite stores or within apps with your MCWV Visa® Debit and Credit Cards using Apple Pay™. Apple Pay is a contactless payment technology that lets cardholders make purchases in store and within apps with just a touch. Apple Pay lets cardholders enjoy all the benefits of their Visa on devices* they use everyday. Users can count on security because their card information isn’t stored on their device or shared when they pay. To pay within stores, hold iPhone near the contactless reader with your finger on Touch ID™. Apple, the Apple logo, iPhone, iPad and Apple Watch are trademarks of Apple Inc., registered in the U.S. and other countries. Apple Pay and Touch ID are trademarks of Apple Inc. Please note that your member information and account information must match exactly what is listed with the credit union. Members Choice will not provide this information to you over the phone, but you may call the credit union at (304) 346-5242 or Toll Free (800) 526-5242 to verify by providing your most current information to the Member Service Representative you speak with. If necessary, you may also submit a Change of Address Request through NTouch24. A convenient way to be able to verify your recent card transaction information for your debit card is by using NTouch24 or the MCWV App, and for your credit card via Online Access.